Round out your job application with a professional cover letter. We have plenty of info about cover letters and how to write your own, but if you are specifically looking to work as a chef, you’ve come to the right place. Use this sample as reference for writing your own, or simply replace our information with your own. If, however, you’d rather have it professionally written, let our cover letter builder do the heavy lifting. 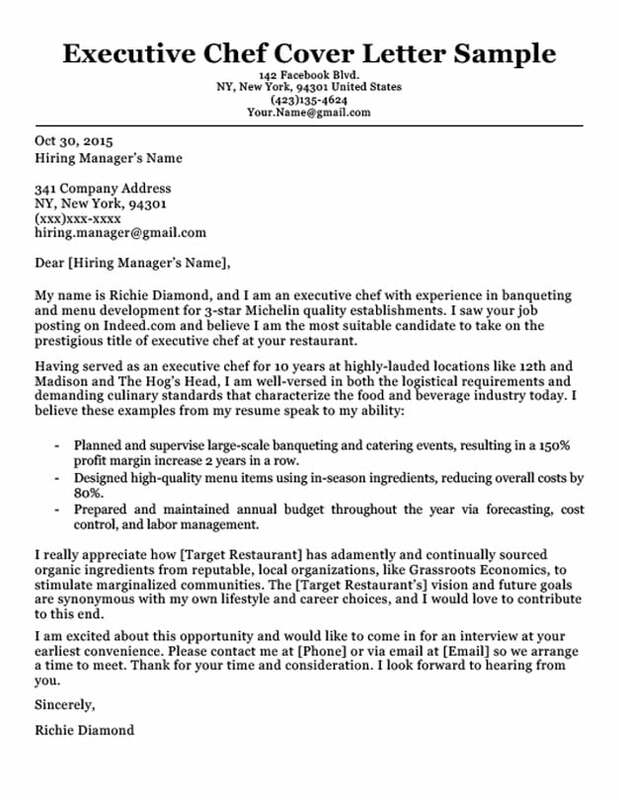 The below images show both the Executive and Sous Chef Cover Letter and their corresponding Resumes. You can download your own for free by clicking the images below. Looking for something different? Check out our cover letter collection for more examples. My name is Richie Diamond, and I am an executive chef with experience in banqueting and menu development for Michelin 3-star quality establishments. I saw your job posting on Indeed.com and believe I am the most suitable candidate to take on the prestigious title of executive chef at your restaurant. Planned and supervised large-scale banqueting and catering events, resulting in a 150% profit margin increase 2 years in a row. Designed high-quality menu items using in-season ingrediants, reducing overall costs by 80%. Prepared and maintained annual budget throughout the year via forecasting, cost control, and labor management. I really appreciate how [Target Restaurant] has adamently and continually sourced organic ingredients from reputable, local organizations like Grassroots Economics to stimulate margionalized communities. The [Target Restaurant’s] vision and future goals are synonymous with my own lifestyle and career choices, and I would love to contribute to this end. I am excited about this opportunity and would like to come in for an interview at your earliest convenience. Please contact me at [Phone] or via email at [Email] so we can arrange a time to meet. Thank for your time and consideration; I look forward to hearing from you. My name is Michael Pratt, and I am a sous chef with extensive experience in fine dining and banqueting establishments. I saw [Target Restaurant’s] job posting on LinkedIn and think that I would be a great fit for the role of executive chef. Revamped menu items with emphasis on local, fresh ingrediants, increasing annual profits last year by 60%. Regularly prepped and cooked for large-scale banqueting events, often seating between 200-300 guests. Monitored kitchen inventory to avoid food waste; cut down food costs 2 years in a row by 25%. One aspect of [Target Restaurant] that has caught my attention, and I would like to contribute to, is the culinary team’s emphasis on incorporating different regional haute cuisine dishes into their menu each week. This encourages customers to venture into previously unexplored gustatory avenues that will open them up to a diverse range of unique and exotic flavors. Working in the capacity of executive chef with your culinary team thrills me, and I would like to come in for an interview as soon as possible. Please contact me at [Phone] or via Email at [Email] so we can arrange a suitable time. Thank you for your time and consideration; I look forward to hearing from you. The food and beverage industry is notorious for haughty egos and high turnover rates. To make it, you need an iron resolve, creativity, self-confidence, and a vision. 1. Be Thorough: The main function of a cover letter is to provide the following information to employers: work experience, skill, and intent. Make sure you include all three of these throughout your cover letter so it looks complete. 2. Be Confident: The food and beverage industry is notorious for haughty egos and high turnover rates. To make it, you need an iron resolve, creativity, self-confidence, and a vision. When it comes to your cover letter, demonstrating these qualities in your writing will show employers you have the “it” factor. 3. Be Precise: Part of having a vision is knowing what you want. You should be emphatic about what it is you desire to do in your cover letter. Are you talented with certain types of cuisines? Do you enjoy creating menu items from leftover stock (a very desirable quality, as it reduces food waste)? Anything like this belongs in your cover letter. It’s fine to use some lines and experiences from your resume to bolster your credibility on a cover letter. 4. Show Off Your Experience: This is all you have as a culinary artist. Chefs pride themselves on where they’ve worked, as should you. Namedrop prestigious chefs you may have learned under, and include weighty titles like “Michelin 3-star,” “La Liste,” and “The World’s 50 Best Restaurants” if you’ve had the privilege to work at such an establishment. Just for perspective (and for laughs), Gordon Ramsay once cried over losing 2 stars at his famed Gordon Ramsay at the London restaurant in New York. 5. 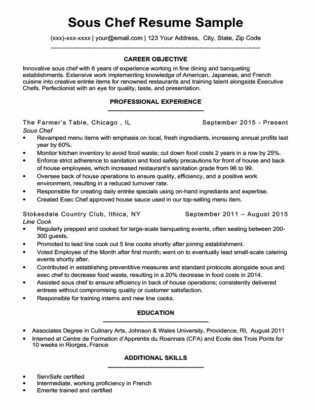 Draw From Your Resume: It’s fine to use some lines and experiences from your resume to bolster your credibility on a cover letter. For example, our sous chef applicant cites his internship experience in France, which will catch the eyes of executive chefs. Also, we recommend including bullet points from your professional experience that highlight your skills and accomplishments.